Today was podcast recording day. Every second Wednesday (generally) my Learning Uncut co-host, Karen Moloney, and I record one or two episodes. Our guests join us on Zoom, a video-conferencing tool. We always start with the video on so we can welcome our guest, answer any questions, and ‘settle in’ before we start recording. However, we have been turning the video off at the start of recording, so we can’t see each other during the conversation. We have done this to reduce the load on internet bandwidth and improve the quality of the audio. While we have been happy with the audio quality, it has impacted the natural flow of the discussion. Earlier this year I was a guest on The Good Practice podcast, and noticed that they leave video on throughout the conversation. One of the things I enjoy about this podcast is the relatively casual conversational tone. Today Karen and I trialled leaving the video on during podcast recording. We did have a technical hitch about 20 minutes into our first recording, but it’s not clear if the use of video contributed to the problem. The second recording was fine. Both conversations felt more comfortable with the benefit of body language. I noticed smoother ‘hand-offs’ in the discussion, shorter pauses, and fewer occurrences of people talking simultaneously. I generally find using video-conferencing improves the quality of one-on-one or small group conversations over phone / tele-conferencing. It’s easier to pick up on the nuances of communication conveyed by body language. Conversations flow better. People tend to focus more as it’s clearer if they are multi-tasking or not paying attention. In my experience Skype for Business is a greatly under-utilised tool in organisations that have it. 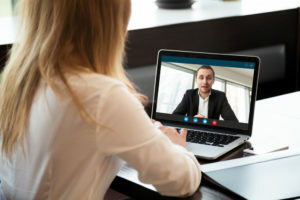 It provides versatile, reliable video-conferencing that you can launch in the moment from your computer, or for scheduled meetings. If you aren’t already using video-conferencing and have access to an easy to use tool give it a go. PS: If it’s not intuitive how to use your selected tool, you can probably find help resources online. Don’t wait to be trained. Please enter your email below to proceed. Thanks!